Last year, the Sepulveda Pass portion of the I-405 was shut down for the destruction of one half of the Mulholland Bridge as part of the $1 billion Sepulveda Pass Improvements Project to accommodate the widening of the freeway. This weekend, the second half of the bridge is scheduled to be demolished, and the 10 mile stretch of the 405 between the 10 and the 101 freeways will be shut down again. Several factors point to this year’s closure having a far worse impact on the Los Angeles weekend commute than last year’s. – The crews finished 17 hours ahead of schedule last year, but it is highly unlikely they will finish just as quickly this year due to a bigger workload. According to a Metro spokesperson, the crews were able to demolish one set of bridge columns last year. This year, they will have to demolish two sets in the same time frame. – The 405 closure is not the only traffic impediment this weekend in Los Angeles. On Sunday two events will close main surface streets in key areas: the Herbalife Triathlon Los Angeles 2012 and the Kickin’ Cancer 5K Walk/Run. The Kickin’ Cancer 5K Walk/Run will shut down San Vicente Blvd from Federal to Avondale, from 7AM to 1PM. See more info about the Herbalife Triathlon here. 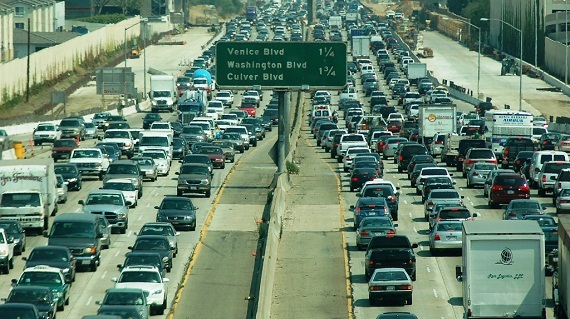 – The original Carmageddon actually caused lighter-than-usual traffic in Los Angeles. Some people chose to stay at home while others opted for public transportation. It is highly likely that Angelenos will assume traffic will be as light as last year, causing far more travel in personal vehicles and thus subsequent congestion of the roads during this year’s closure. NOTE: Ramp closures will begin as early as 7PM tonight, with a full closure scheduled for around 11PM. This means that traveling out of the San Fernando Valley to Los Angeles will require traveling on Sepulveda Boulevard (which will remain opened during the 53-hour closure) or the canyons, so plan ahead. Interesting Fact: the 405 is the busiest freeway in the nation, connecting two other heavily-trafficked freeways – the 10 and the 101. If you do not wish to deal with traffic yourself, contact us to reserve Los Angeles limousine service today.